I admit it. The first time I saw the Evangeline “memorial” (if imaginary people can have memories) at Grand-Pré, I was impressed. It was beautiful. Located in the Nova Scotia Annapolis Valley near New Minas where my son’s soccer team was playing in a tournament, it made for what seemed like a natural stop for what had turned into a family vacation. Grand-Pré was, of course, a site of Acadian settlement destroyed — along most other Acadian communities in Nova Scotia — by the Expulsion of 1755. The site has its own history, some of which has been related by Ian McKay and Robin Bates’ In the Province of History. The Annapolis Valley was an early and important site of historically-oriented tourism as middle-class Americans flocked north after the publication of Longfellow’s Evangeline in search of a picturesque, almost mystic and tragic land. Today it is an important stop for tourists visiting the region and it is easy to see why. The manicured lawns, stone church, and striking statue lend it an almost spiritual quality, something that might not be accidental. Initially, the federal government was not all that keen on commemorating the Deportation but today Grand-Pré has become a UNESCO sanctioned World Heritage Site. It is easy to see this site as another example of the antimodernist invented traditions placed in the service of consumer capitalism. But, that would not be wrong. There is something deeply disturbing about tourism at Grand-Pré. But, I will argue in this post, there is something else we should be considering when we look at sites like Grand-Pré that commemorate, mark, memorialize — whatever language we seek to use — deeply tragic historical events. That is: the way in which sites like Grand-Pré work to establish an ethical or moral distance between the past and the present. There are both troubling and important implications to this moral distance. 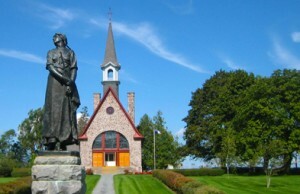 The 1956 agreement between the federal government and the Société Nationale l’Assomption, acting on behalf of the Acadian people, acknowledged that “the Grand-Pré Park is considered the most important historic Site by the Acadian people, that it recalls their saddest and most heroic moments and must remain for future generations the example of courageous people whose culture and actions shall enrich more and more the Canadian nation”. There are two readily recognizable problems with this narrative. First, it mystifies the past. The Parks Canada narrative is just accurate enough to be unsettling. For example. there is no doubt that Acadian culture is important but simply stating that elides the entire history of the Expulsion, systematic marginalization thereafter, and the fact of deeply entrenched and on-going anglophone opposition to the equality of the French language in the region. Canadian stamp of 1930, showing the Grand Pré historical site in Nova Scotia. The second problem is also evident: the commodification of tragedy. There is something just wrong with turning a site of ethnic cleansing into a tourist attraction, even if those words are not often used to describe the Expulsion or Grand-Pré. The whole making-tragedy-picturesque approach to commemoration deserves more regular critique because, then, maybe, people will stop doing it. I recognize the merits of this criticisms and subscribe to them. As I thought about what was actually going on at Grand-Pré, however, a third trajectory of concern began to run through my mind as my kids asked questions about what happened, how it could have happened, and why anyone would do such a thing. Recently, these questions came back to my mind — and hence this post — when my daughter asked me questions about what happening in Ferguson, US. Her dumbfounded “why would anyone do that?” type of question was naively rewarding even as I discovered I had no easy answer for her. One of the things that sites like Grand-Pré do in marking tragedy — in addition to commodifying and mystifying the past — is to create a moral distance between it — the tragedy of the past — and the present day. We can readily recognize that bad things happened in the past. Rotten people did rotten things to innocent people. After all, that is the tragedy of Grand-Pré. But, in marking these events as past, we separate them from the present and fashion a subtext that situates contemporary society in a different ethical time. We are all well aware of the problems with the argument “you can’t judge the past” — as if simply saying that people lived in a different context excuses intensely problematic behaviour. Historically marking events like the Expulsion works with a different set of ideas. Here, the past is judged, but the judgement is presented in such a way as to maintain a progressive narrative. As we look over Grand-Pré, think about the Deportation, and consider its implications, we understand it as a bleak, horrifying event. But, that event (and, it was actually much more than an event) is isolated from the present. We can consider its tragic, disturbing elements from the perspective of hindsight in way that makes the present better than the past. We — at least the middle-class tourists milling about Grand-Pré — don’t ethnically cleanse. We are better than this; the present can be held up as not simply different but ethically better than the past: more humane, more caring, less prone to acts of barbaric violence. At least two issues that are important for an active history follow from the moral distance sites like Grand-Pré create between the past and the present. To me, these issues admit no easy black and white/good and bad assessment. First, the moral distance built into this narrative helps us to understand how history works — and more importantly how progressive narratives are maintained — in culture. After all, anyone who has read any of the strands of the critical historiography of the last generation will have a difficult time telling an uplifting, progressive story about Canada. Yet, this story is still powerful and still important. It has, perhaps, become ironically more powerful and more important since the advance of critical historical study over a generation ago. Tragedy is recognized all the time, even if only in a sanitized form. All matter of horrifying events — from residential schools to internment camps to racism to oppressive anti-labour legislation — are now better understood and marked than they were in the past. Yet, these same events can be mobilized to sustain a progressive narrative if we separate the past from the present. The horrors of the past are acknowledged at the same time the idea of the different and progressive nature of the present is reinforced. I would argue that Canadian society has gotten very good at creating this ethical distance. Apologies to Original Peoples, for example, are legion. There is a power to this ethical distance that is difficult to quantify and critique. After all, who could disagree with official apologies for residential schools? But, however important an apology is, we need to recognize its historiographical dynamics. More exactly, we need to recognize the relationship it establishes between the present and the past. An apology suggests, for instance, that the current state occupies an historically different — and superior — ethical space than it did in the past. And, we might wonder: is this so? Second, and following from this, we need to grapple with the popularity of this narrative. As I hope is clear, it is not just at Grand-Pré that we can find this whiggish ethical historiography. One of my favourite examples comes from a seminar I attended years ago as a grad student. The guest speaker was a noted American historian and documentary filmmaker. He had just made a film about workers in the Great Depression. The political point of his film was to illustrate the relevancy of class conflict. When he showed this film — this would have been in the early 1990s — to workers, he got a very different response. As he explained, instead of learning his point, workers tended to say “thank Heavens we don’t live then. Things are so much better today.” Against intentions, his audience fashioned a progressive moral narrative and did so in the wake of the ascendancy of neo-Conservativism in the US. My guess is that we have all encountered this kind of narrative either overtly or implicitly. We have all talked to someone who said “well, we did not know any better back then.” And, that might be true. I don’t want to prejudge an inquiry into this plotline. It runs against the tenor of contemporary historiography, but simultaneously illustrates one important way in which history is mobilized in the broader culture. It illustrates the uses to which history is put and one reason why history retains its importance in the broader society. It also illustrates the relevance of judgements made about the past. Mobilized in this way, history becomes a morally-charged story that says important things. I might disagree with specific conclusions but understanding why this narrative is so popular and how it is embedded in heritage commemoration provides, I think, an important point of engagement for active history. I don’t have an easy conclusion to this blog. Exactly how we should engage tragedy, mark it, and represent it remain open questions. I fully believe that we need to represent these deeply disturbing elements of the past. I don’t want to easily dismiss the narratives of ethical progress evident at Grand-Pré and elsewhere. Nor do I want to easily accept them. To be sure, these are complicated narratives that tell more than one story. Exactly how we work with these narratives is, however, something that those of us involved in active history should think about. Andrew Nurse is a Canadian Studies professor at Mount Allison University.